March 17-- Mrs. Ruby Dell Scott Rushing, age 88, of Lyons, died Saturday, March 16, 2019, in the Community Hospice House in Vidalia, after an extended illness. She was a native of Kite, and lived in the Kite area until moving to Toombs County in the late 1950’s. She retired from Oxford Industries after thirty-five years of service. She was a member of the East Gordon Street Baptist Church in Lyons for fifty-seven years, where she taught Sunday school, sang in the choir and served as Treasurer for PALS. Until the last few years, she enjoyed line dancing and any activities with her children and gradchildren. She was preceded in death by her husband, Hugh Dorsey “H.D.” Rushing; one son, Jimmy Rushing; parents, Loran A. Scott and Bessie Fields Scott; a grandson, Billy Scholl; an infant great-grandson; two sisters, Louise Blassingame and Cubalene Briggs; two brothers, Samuel A. Scott and Little Lewis Scott. Mrs. Rushing is survived by three children, Larry Rushing and wife Glenda of Lyons, Miriam Rushing Darden and husband Jackie of the Normantown Community, and Harrison Rushing and wife Judy of Vidalia; one daughter-in-law, Carol Rushing of St. Mary’s; three sisters, Jean Gashaw and May Powell, both of Lyons, and Donna Johnson of Hagan; two brothers, Thomas Scott and wife Bonnie of Lyons, and Mickey Scott and wife Tonja of Vidalia; eleven grandchildren, Robin Jarriel and husband Clint, Clayton Rushing and wife Krysta, Mitch Bellflower and wife Kelly, Mike Bellflower and wife Veronica, Angie Collins, Jennifer Wolfe and husband Neal, Jason Rushing and wife Regina, Tonya Rushing, Norma Crooke and husband Bruce, Sherry Cobb and husband Herb, and Michelle Arnold; twenty-three great-grandchildren, sixteen great-great-grandchildren, and numerous nieces and nephews. The funeral service will be held Tuesday, March 19th at 11:00 a.m. in the East Gordon Street Baptist Church with Reverend Mitch Bellflower and Pastor Bruce Conner officiating. 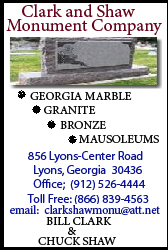 Burial will follow in the Ephesus Primitive Baptist Church Cemetery near Register. The family will receive friends at the funeral home on Monday evening from 6:00 until 8:00. Flowers will be accepted, or memorial contributions may be made to the Community Hospice Foundation, P.O. Box 2277, Vidalia GA 30475.